On December 24, 1968, the American astronaut William Anders photographed earth as his lunar module orbited the moon. The earth sits suspended in a deep dark background as it appears to rise above the crest of the moon, layering the bottom of the photograph. ‘Earthrise’, as it was soon called, quickly became famous. The photograph was, and remains, a quintessential document for our humility as fragile and insignificant homo sapiens. In American popular memory, this photograph is axiomatic to multiple photographs of earth taken from unfathomable distances. As earth rises from the lifeless, gray moon we can grasp our relative position in the universe. However, magazine publishers rotated Earthrise right so that earth appeared to rise from the moon, giving us some special position. The original photograph showed the moon on the right and earth placid in the left of the frame. In the rotated version, a vibrant humanity rises from a lifeless rock. Initially, it is a beautiful and first-ever reflection of earth in space. 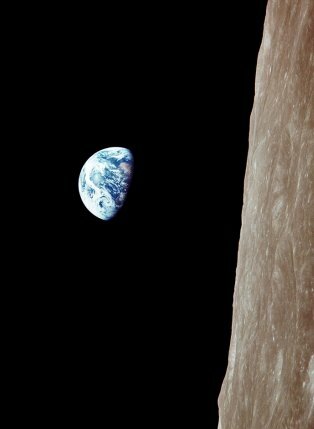 But Earthrise was soon embodied with a Cold War anti-nuclear and, later, environmental message: we too could become a lifeless rock, lest we keep our actions from destroying the human species. This post examines photographs of earth taken first by astronauts of NASA’s Apollo missions and then by satellites launched into interplanetary space. In my analysis, I borrow approaches from Catherine Lutz and Jane Collins’ Reading National Geographic and Shawn Michelle Smith’s At the Edge of Sight. I use Lutz and Collins’ analysis of different gazes. This analysis is important when analyzing photographs reproduced in media such as magazines or newspapers. I also borrow from Smith’s interpretation of Edward Muybridge’s scientific photographs that tracked physical movement of human and non-human animals. Smith argued that the impulse behind Muybridge’s photos were not so scientific as they were cultural. Smith’s approach applies to both the impulse and retrospective interpretation by astronauts to images of earth from ‘outside’. I argue that these photographs attempted to legitimize a specific scientific-historical view of ‘our’ collective past as a universal past. This approach assumed a scientific history of the universe as infinite, very old, and, therefore, humans as late, insignificant players on the scene. This view reduced war to a political problem and saw scientific understanding and technological advancement as a universal approach towards human progress. Therefore, I interpret Earthrise and subsequent photographs that intended to document the fragility and insignificance of humankind (this meaning was embodied in images of earth) as indicative of particular American Cold War and, later, environmentalist views. A Lutz-Collins approach benefits our understanding of the two Earthrise photographs above. What gazes are present here? The astronaut’s gaze is implied. The astronaut views earth not as rising but from the side as he orbits the moon (in an environment without gravity he could view it from all angles as he floats around). But does the earth or moon have a gaze? Can a rock gaze back at you? There is a complex notion of ownership and authority here. Earth is ‘our’ planet (though inhabited by billions other species). By photographing we look back at ‘our home’. 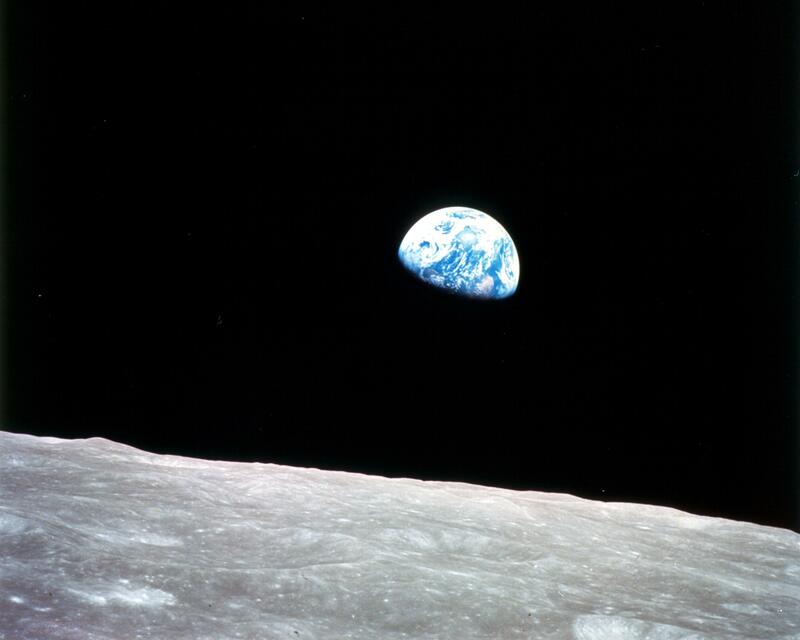 Interpretations of Earthrise championed that it revealed how fragile and alone we are in the universe – that we cannot destroy this only home we have. But who is ‘we’? There is another gaze here that is not obvious: the billions of humans on earth, reduced to a universal experience on a blue rock floating through space. It imposes a specific scientific-historical view of earth and universalizes individual experience. But not all of those humans have the privilege to view Earthrise. Thus enters the magazine’s gaze. Life magazine placed Earthrise amongst the 100 most influential photographs ever. But this is a very particular choice by editors at Life. Why were none of the other hundred photos chosen? However culturally influential Earthrise was, Life nevertheless assumed that Earthrise was influential to entire populations. An expanded analysis of these gazes would have to examine the many other magazines, newspapers, and books that published Earthrise. Michael Collins who orbited the moon as Buzz Aldrin and Neil Armstrong walked on its surface later said “Oddly enough the overriding sensation I got looking at the earth was, my god that little thing is so fragile out there.” It is difficult to discern the original impulse of photographing earth. Astronauts worked for the United States government during the Space Race and therefore photographed earth as part of their job. Many of the Earthrise-esque reactions from astronauts to seeing earth from the moon were recorded years after the event when environmentalism and peace movements were prominent in the popular American scientific community. Reactions to Earthrise, then, show how astronauts viewed themselves as distinct from politics, seeing war was a political endeavour. And if politics is the problem, then the brotherhood of man is a viable path, aided by human technological progress. The astronomer Carl Sagan interpreted this view when he recalled the moon landings: “For me, the most ironic token of [the first human moon landing] is the plaque signed by President Richard M. Nixon that Apollo 11 took to the moon. It reads, ‘We came in peace for all Mankind.’ As the United States was dropping seven and a half megatons of conventional explosives on small nations in Southeast Asia, we congratulated ourselves on our humanity. We would harm no one on a lifeless rock.” One can apply this same sentiment to reactions of Earthrise. In 1968, the Vietnam War was at its height. How could a nation waging war in South-East Asia look back at earth and argue for a brotherhood of man? But astronauts, at least retrospectively, viewed themselves as achieving something for humankind and thus distinct from politics. Their sentiments were motivated by scientific notions of human progress. As NASA outstretched itself into the universe, the Earthrise tradition continued. In February 1990, Carl Sagan turned the Voyager satellite back at earth and took the iconic photo named ‘Pale Blue Dot’. Sagan’s description of the photo is strikingly similar to those of the Apollo astronauts. In his book Pale Blue Dot, Sagan goes on to described humankind as a lone voyager in a “vast cosmic ocean.” The Voyager spacefract is a symbol of man moving out into undiscovered lands, much like early primates of the Homo genus traversing earth. He frames this inherent human urge as curiosity and a desire to expand ‘our’ frontiers. What I am trying to problematize is that this is the view of a specific American scientific culture. Sagan shares a reflective moment, albeit one that holds the moral disapprobation of war and death as both a scientific value, and, therefore objective, while also representing the absurdity and implicit disapproval of certain people’s actions. Earth becomes a small theater of insignificance. And earth, framed as insignificant in the photograph, is made significant and meaningful through its insignificance. There is a paradox here. In destabilizing the geocentric privileging of earth, our ‘home’ becomes the center of the model. Thus, Sagan implies the dialectical nature of the photograph. The outward voyage into the universe implies earth as some point in an outward discovery. And, by the volition of certain privileged people, the gaze literally returns to earth. There is a partial difference between Sagan’s impulse and the astronautic documentary impulse. American astronauts photographed earth as their job. Only much later did they publicly comment on looking back at earth and feeling moved by our insignificance. Sagan, on the other hand, described his impulse to photograph earth to deliberately present humankind’s cosmic fragility. What these men share, however, is a privileged view that literally only dozens have had in history. From their privileged vantage point, they legitimize and thus impose their particular scientific views of cosmic insignificance on all humankind. They do not deny the importance of human experience – they champion what they view as insignificance based on their own understandings of the universe. They assume our cosmic insignificance through a positivist view of scientific-objectivist history: it is a fact that the universe is large because we can measure it; that we are small because of our relative place in the cosmos; that earth is one of many planets (this was a very recent view since there was no scientific ‘proof’ of planets outside of our immediate surroundings before the last twenty years); that we are even ‘late to the show’ on our own planet (see Sagan’s cosmic calendar). Through this understanding of an infinite, very old (possibly timeless) universe, these men concluded that humankind’s mere existence upon this rock we call earth is incredibly insignificant. In 2013, NASA’s Cassini spacecraft reproduced the iconic Pale Blue Dot photograph. Moreover, it sees earth as a history of humankind. Through its already contradictory nature, it subjects all by democratizing humanity. The meaning Sagan inscribes is to democratize the human experience which appears inherently colonial to an extent. This reflective view gives authority to the scientific eye: they are the ones who have achieved a great feat of human progress – a view that we all ought to share. However such a colonial reading is too simple. NASA almost refused to turn the camera back onto earth. Some of Sagan’s colleagues argued that such a photo was pointless and non-scientific. Sagan differed. The contradiction here is obvious: the scientists themselves could not agree on what was scientific. Voyager was supposedly a tool of science: it took photos of planets to see if scientists were right about their knowledge. This process legitimized science. For Sagan – the prominent popularizer of science – however, science was not necessarily in the photo as documentary, but as a practice of reflexivity. That is, to view earth as it had never been seen and to reproduce sentiments in the Earthrise tradition. It is difficult, then, to describe these photograph as inherently colonial. There is no doubt that they impose a particular view on human experience. But they are suspended – specifically for Sagan – in an era of growing environmentalism. Pale Blue Dot is a moment of personal reflection for Sagan in his own historical musings on the longue duree of geological time. He is entrenched in his own historiographical experience which privileged the history of the universe. He deduces absurdity from the sheer size and time of the universe. He challenged extreme religious and geocentrist views of anthropocentrism. Pale Blue Dot was, therefore, integral to his work as a popularizer of science. Within their particular historical views, some scientists and astronauts sought to universalize human experience with good intention. It is apparent, though, that their assumed objective views reduced a single human experience from a photograph of earth. This reduction stemmed from a view of a vast universe. Earth was cosmically insignificant and, therefore, needed to be saved from silly human politics. Earthrise and Pale Blue Dot embody a single gaze which, we have seen was superficially, albeit authoritatively, reflective. I wonder what our outward gaze of the universe – the hundred billion galaxies with hundred billion stars – means. For instance, although the Hubble Telescope and the multiple spacecraft floating in space have human operators, do satellites have a gaze? Other complexities arise: astrophotography was not born with the Hubble Telescope. For centuries, with the aid of telescopes, few privileged humans have photographed other planets. While this requires further study, I believe it speaks to a certain documentary impulse to know our place in the universe. When humans first left earth they photographed the planet on which they were born. Astronauts aboard the ISS photograph earth quite often. However, scientists increasingly focus on other planets, stars, and galaxies, and Hubble receives occasional lens upgrades to peer deeper into the universe. For what this means now, specifically with the availability of space images online, I am not sure. But what Earth Rise and similar photographs present is a specific Cold War American scientific gaze.